Time and time again I get asked this question from readers and random people who Google questions about their Pfaff Grand Quilter. My blog comes up in the search and they typically end up asking the following question….always in reference to thread breakage on their Pfaff Grand Quilter. 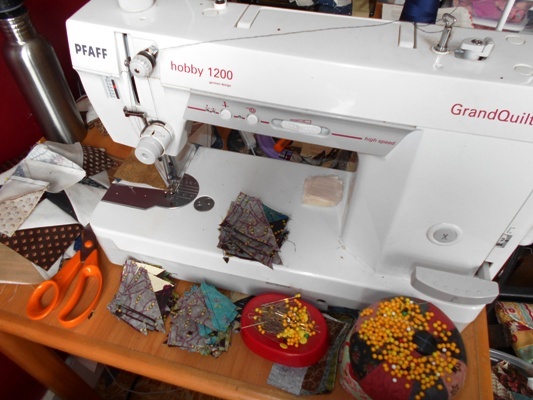 I used to have a Pfaff Grand Quilter. For the first year I liked it and had few problems with it. Along came year two, three and four. YUCK..pooh….awful. It was horrible. Thread breakage plagued me…and not just a little bit. IT WAS AWFUL!! I can honestly say now that I developed anxiety over using the machine. I would have a quilt that needed to be done on a specific date and I would do everything I could to not have to do it. I HATED it. Sometimes the machine would work…other times not. There were times when I would sew five inches and the thread would break time and time and time again. Hubby would be trying to help me and a would be bawling…not just crying…BAWLING. Here is a post from the really bad days. I tried and tried and tried things. I got a new plate-a new bobbin case-I replaced every part I could think of. Sometimes it would work…sometimes not. I tried different thread-different batting-I maintained that machine to the max. It was totally unpredictable. Finally, Hubby could not stand it any longer and said enough is enough. You are buying a new machine. I can’t stand you being upset all the time. In comes my APQS Millennium. 1-Judy at Patchwork Times had one and Bonnie at Quiltville had one. Both of them are helpful bloggers that I knew if I had questions I could ask. 2-A friend and two of the quilt shops in our area have APQS macines…again another resource if I need help. 3-There is an APQS dealer o2b Quilting in Spring Valley, MN a little over an hour away from me…another resource. 4-They are an Iowa company…again a closer resource-they come and set the machine up!! 5-They sell refurbished machines so that’s more affordable. I ended up getting a refurbished APQS Millennium. They are honestly MUCH-MUCH cheaper than new. So much cheaper that they are comparable to domestic machine companies that come out with a mid arms. I am not going to lie and say I never had problems with my APQS but so far, no problem that I couldn’t solve by changing thread, cleaning the machine or changing the needle…all typical problems. 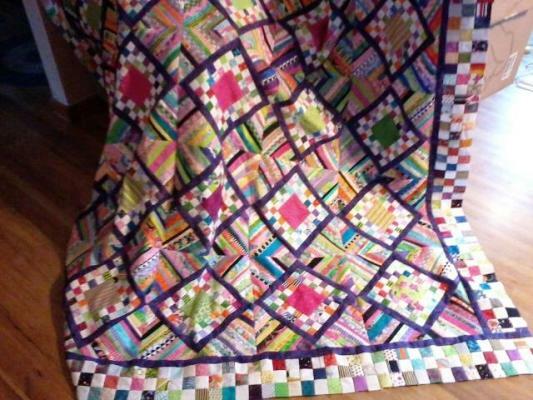 I am also quilting quadruple the amount of quilts that I was before….and the best part, I have never cried. Many companies, Baby Lock, Pfaff, and Bernina and I am sure others make mid arm machines and many quilt shops sell them. BUT take note. Does the quilt shop use those machines for their custom quilting…NO. They used APQS or other machines that are long arm machines. That should have told me something from the time I originally purchased the Pfaff Grand Quilter. The bottom line is this….I never did figure out the problems I had with my Pfaff Grand Quilter. To be honest, I just think there is no fixing the problems. I TRIED EVERYTHING…it would sometimes work for a bit and it might not work at all. Figuring how to prevent thread breakage on my Pfaff Grand Quilt was a mystery that I could not solve. That is why I moved on and bought a different machine. I thought about selling my Grand Quilter and frame when I got my APQS but Hubby and I decided no…that wasn’t right to saddle someone else with those problems. So I took the machine off the frame (trashed the frame) and started using the machine for piecing. I am completely and totally love my Grand Quilter for piecing. For that, it can’t be beat. I have a Bernina 165E. I no long use it. I would MUCH rather piece with this machine. It is a work horse. It has speed. It is an amazing machine and honestly, if I come across another, I just might buy it as Kelli and I fight over this machine when she comes home to sew with me. I am so sorry that so many people have had the same problems with their Pfaff Grand Quilters…I can’t solve your problems and to those of you who are in the market for a long arm machine, pay a little more and skip the mid arm machines…that’s the best advice I can give. If you must keep your problem machine, keep a diary of each quilt, what thread, what backing, what batting. Note everything you can and maybe, just maybe you will be luckier than I was a figure your problem out. With all machines, sometimes slowing down does help. I am sorry, I can’t help more. I know the problems are completely frustrating and I honestly understand how frustrating the problems are. Each day leading to Thanksgiving I write about something that I am thankful for. Today I am thankful the in-laws that are coming into the family fold. Several years ago when our children were in confirmation class the pastor who was teaching class, Milton Johnson, who we dearly loved and miss, suggested to his confirmation class of 13 and 14 year olds that they should start praying that God provide their perfect mate. The kids came home and told me about that. I thought-dah…of course they should be…why didn’t I think of that?? From then on I periodically asked that our children be blessed with the perfect mate. Well…the perfect mates are lining up. Last year Kayla married Spencer. In August Buck married Jen. In March Kelli will marry Jason. Kalissa has a pretty special guy, Craig, waiting in the wings. Each of these people honestly seem perfect for my kids. They each compliment them in ways that I never imagined until I met them. I think all of them will be in the family for years and years to come and I can’t wait to see how their relationships expand and grow. Today I am so very thankful for Spencer, Jen, Jason and Craig…and for the girl that is out there somewhere for our son Karl. 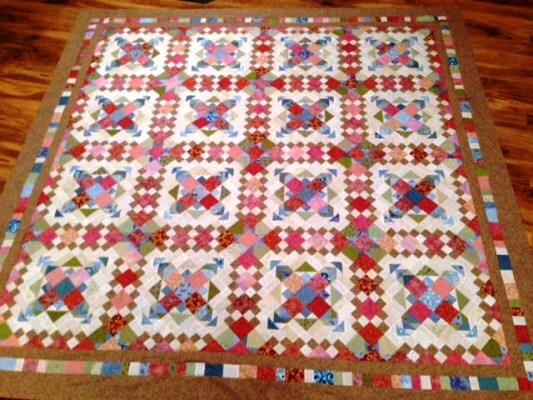 This entry was posted in Ask Jo, Fellow Bloggers, Quilting on November 27, 2013 by Jo. Michelle from the Quilting Gallery was sponsoring the Be Thankful Blog Hop and Giveaway. Bloggers are all getting together and having a big bunch of giveaways which is always lots of fun. We joined in by offering this prize. Thanks to all who played along! This entry was posted in Fellow Bloggers, Giveaway on November 26, 2013 by Jo. Counting down to Bonnie Hunter’s mystery several of us are working to finish up a Bonnie Hunter UFO. Feel free to join us and link up your quilt or leave a comment letting us know what kind of progress you are making. Well we only have one more week to sew before Bonnie Hunter’s Celtic Solstice mystery starts to finish up our UFO’s. How are you doing?? I managed to get quite a bit of sewing time in. Dixie (our foster beagle) loves sleeping behind my chair in the sewing room so I’ve spent a little time there with her sewing a few seams then giving her a pet or two. I’ve managed to have finish up all of the star blocks with the brown star. I need six more of the ones with the blue centers. I started on the chimney and cornerstone blocks but still have work on them to do. My goal for the next week is to just get all of the blocks finished up and to get the border triangle pieces all cut. That way I can kind of clean most of it up. I’ll use those outside border pieced triangles as my leader and ender until I get them finished up-and my project won’t end up back in the UFO pile. I don’t know how much sewing time I’ll get next week though. The kids are coming for Thanksgiving. Our son, Karl, will be home for Thanksgiving break. I’m sure I’ll manage to sneak some time in though…Hubby knows I’ll need it for my sanity. I never thought about doing it in brights…I am so in love with this. It’s a real beauty and now I want to make one!!! That has been a bad thing about this challenge. It has made me want to make MORE Bonnie quilts. Sigh…. Thanks for the encouragement :-)” It does work Ila and the quilts are amazing. Check them out reader by clicking on the link. Next up from Cathy…it’s Easy Street! Beautiful right?!?! If any other non bloggers want to share a photo of their finished top, send me the picture and I’ll add it to next week’s post. Here’s my email, rogjok@iowatelecom.net. Each day leading up to Thanksgiving I write about something I am thankful for. Today I am thankful for my daughter Kelli…It is so nice to have a kid that live close to home and for us, that’s Kelli. When Hubby is in the farming, she’s my entertainment committee. See??? I can tell Kelli anything…It’s kind fun because I can treat her like a friend and not just be the mom, although sometimes, I need to be the mom just to get her to quit her craziness. Often times Sunday will roll around and I can’t figure out why my stomach hurts…it’s because Kelli was here and she had me laughing til my belly hurt the day before. She, like all the other kids, is real good at helping us out. Time and time again she has helped at the new house. She helps with dogs a lot too. She doesn’t “visit” when she comes home…she just comes to do whatever we’re doing. Whether it’s sewing, working at the house in town, going to auctions, working in the garden or whatever, Kelli’s willing and ready to tag along. Since she was born, she’s been my buddy and I guess she’ll always be. I love that we have now working on quilt things together…it’s a natural extension of our relationship. I’d be lost without her. Today I am thankful for our daughter Kelli…plus I am so happy she is coming home today. Two weeks and no Kelli, I’m going into withdrawal!! This entry was posted in Bonnie Hunter, Fellow Bloggers, Quilting, UFO Quilting on November 23, 2013 by Jo. Quilting Gallery’s Be Thankful Hop and Giveaway! Did you hear about the Thank You Blog Hop Party? Michelle from the Quilting Gallery is sponsoring it. Bloggers are all getting together and having a big bunch of giveaways November 21st-26th. You can go to each blog to sign up and win something. I am guessing many of you are new to our blog so before I show you what we’re giving away, I thought I’d show you around. To the right under the ads are our tutorials and free patterns. Each Tuesday we host a “Try it on Tuesday” where we review quilt books and quilt related goodies often giving them away to our readers. We’ve been busy with a foreclosure house we are remodeling and hoping to move into next year, farming and quilting. We always have fresh new posts once or twice a day. I hope you’ll keep coming back as we love share our time with you. One of the easiest ways to keep up with us is via our Facebook page. Kelli and I dug through the prize pile and found a great book from Martingale and Company, Country Threads Goes to Charm School by Connie and Mary from Country Threads. It’s an awesome book. The premise if to take one charm pack, add some yardage and you have just what you need to make a project. Would anyone like to win?? I can sweeten the bunch just a bit by throwing in a little pack of 5″ squares to get you started on your first project. Each day in November up to Thanksgiving I’ve been writing about something that I am thankful for…. Today I am thankful for our “new” house. If you’d like a peak at it you can see it here. We have gotten a few bids in and remodel may cost more than we expected leaving us having to scale back a bit. I am still thankful though. I am really ready to start a new chapter in our lives. Last weekend we got a couple things that will make the remodel a bit easier. It just makes me happy knowing the work we’re doing is ours and for us. If you’d like a chance to win the goodies, leave a comment telling something you are grateful for. We’ll pick a winner in a week or so or whenever I remember. 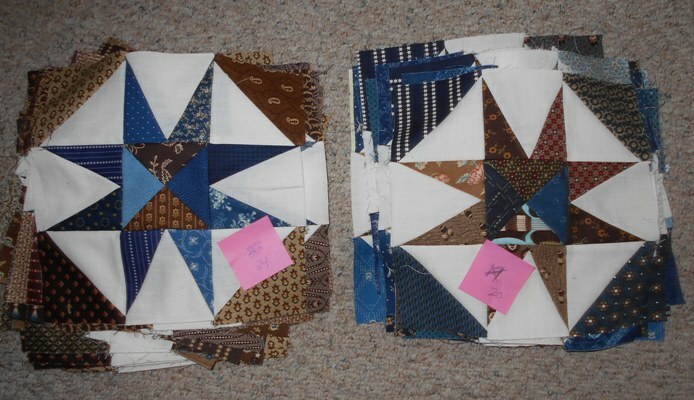 This entry was posted in Fellow Bloggers, Giveaway, Quilting on November 21, 2013 by Jo.